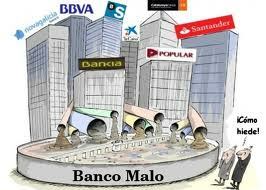 Spain agreed in June to receive up to 100 billion euros in European aid for its troubled banks. The bad bank, known by its Spanish-language acronym SAREB, was set up as a condition of that bailout; all banks that receive European aid will be obliged to transfer assets to the bad bank. Sareb will be established as a for-profit company that will not be part of Spain’s central government. SAREB, which is set to begin operations on Dec. 1, will absorb soured investments that have dragged down the balance sheets of Spanish banks since the collapse of the country's housing market four years ago. The Spanish “bad bank” has been created to take on, and then sell off, assets such as undeveloped property and unfinished buildings to restore the banking sector to health. The new entity goes under the name of “Sociedad de Gestión de Activos procedentes de la Reestructuración Bancaria” (SAREB), “Society for the management of assets proceeding from the reconstruction of the Banking System” and is expected to take over up to 90 billion euros of bad property. According to Spain’s economy minister Luis de Guindos, assets will be transferred into the new entity “at a conservative price” and with “significant discounts”. Within one week of the launch of SAREB next month, the Spanish central bank is to establish the exact price of assets transferred to the institution by Spanish banks, based on evaluations by an auditing firm. Sareb is to be financed with public funds but Spanish authorities also hope to attract private investors willing to underwrite at least 55 percent of its capital.